As we already mentioned, the principle of MAC layer is to delay transmission until the medium is idle. 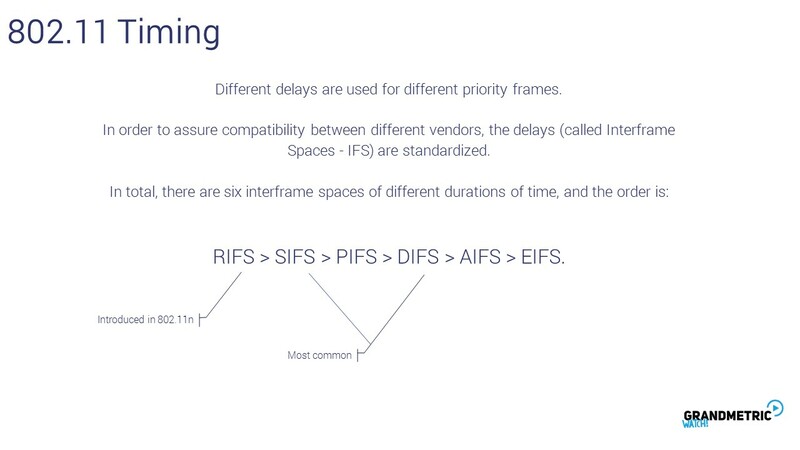 In order to introduce priorities for different frames, different delays can be used. High priority means short delay. 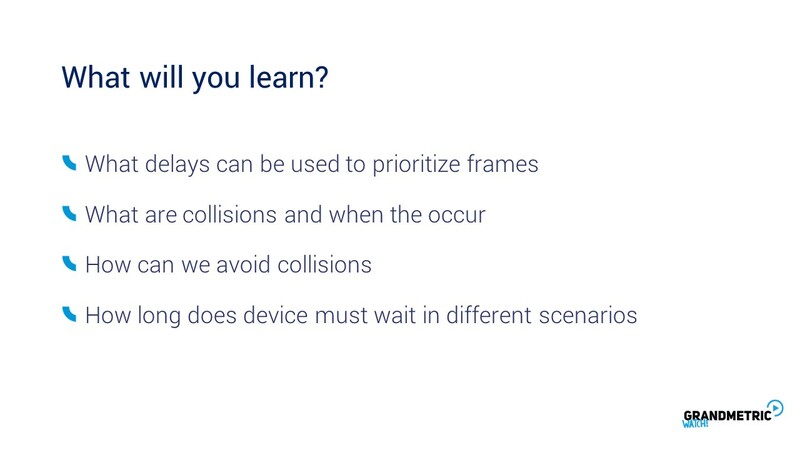 The transmission can start earlier, and therefor „jump” before low priority frame. High priority is usually used for control messages (ACK etc). SIFS is the shortest delay used in initial releases of the standard. This time is used during single frame exchange required to finish an ongoing sequence (eg. RTS/CTS or DATA/ACK). This prevents other devices to interrupt the transmission. Other STAs must wait for a longer period than SIFS to Begin new transmission. This time is also used for other side of the transmission to know how long it should wait for the response. Upon receiving data, receiver must calculate CRC, check for errors and proces the message before stating if its ok. This can take some time. Therefor if the transmitter does not get ACK after SIFS it knows that there was some kind of problem with the reception. 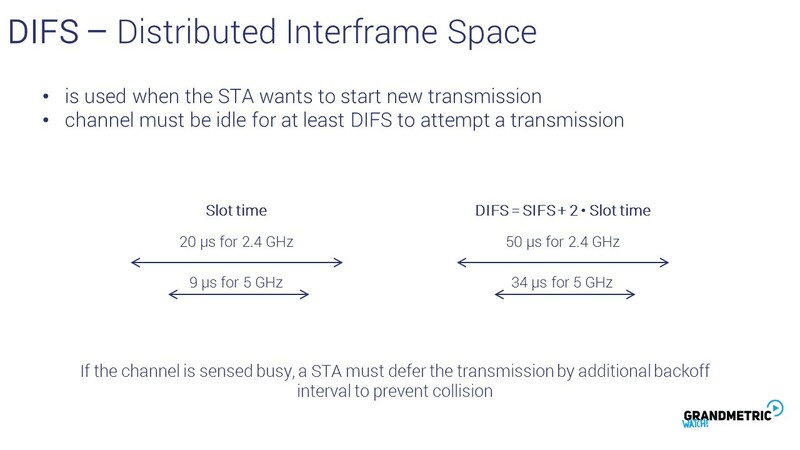 Then, the DIFS is used, when a STA wants to init new transmission. It must wait at least DIFS, which is longer than SIFS. It means that the new transmission cannot interrupt any ongoing transmission. But that’s not all. STA must wait additional backoff time. This prevents too many collisions occur, when many STAs want to transmit. Let’s see what would happen if only DIFS would be used. 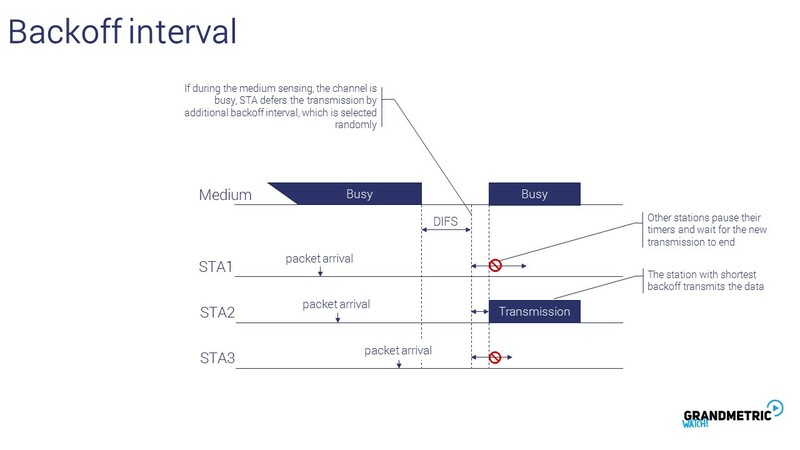 If the medium is busy for a long time, a lot of different STAs can get in line to transmit. They all sense when the medium becomes idle and wait DIFS they all start transmission at the same time. So in this example all three frames will collide. 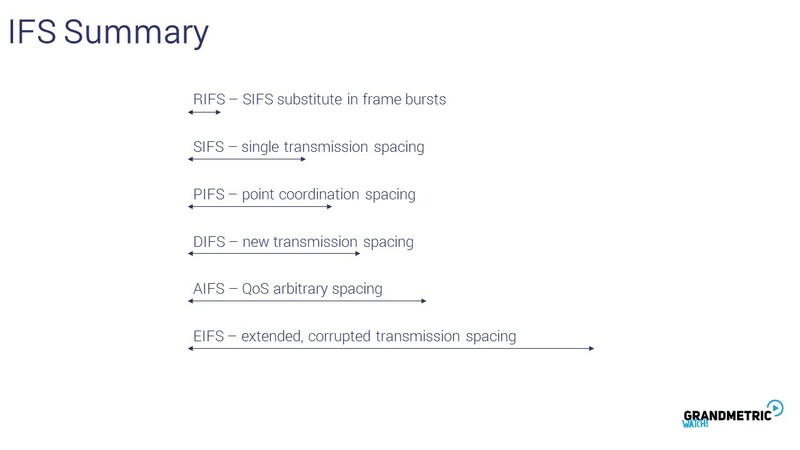 Instead, after DIFS all STAs select backoff interval randomly and wait that additional time. Then the STA that chose the lowest value start transmission and all others freeze their timers as they can sense the medium busy. 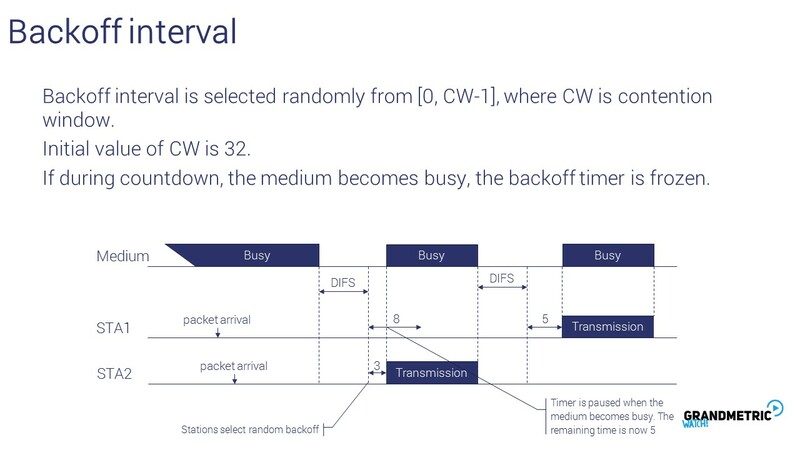 Backoff is selected according to uniform distribution over a range 0 – CW-1. The larger the CW the lower the probability of collision. As stated before, if medium becomes busy, the timer is frozen. This means if eg. One STA selected 8 and the other 3. Obviously the one with shorter backoff starts the transmission. But the other station already counted down from 8 to 5, so when the medium becomes idle, it resumes countdown from 5. If the transmission does not success, the CW doubles. If the errorneous transmiossion are one after another the CW doubles until it reaches 1024. Then it can reset after first success to the initial value of 32. This mechanism prevents from network performance drop in case of the device that often gets failed transmission. 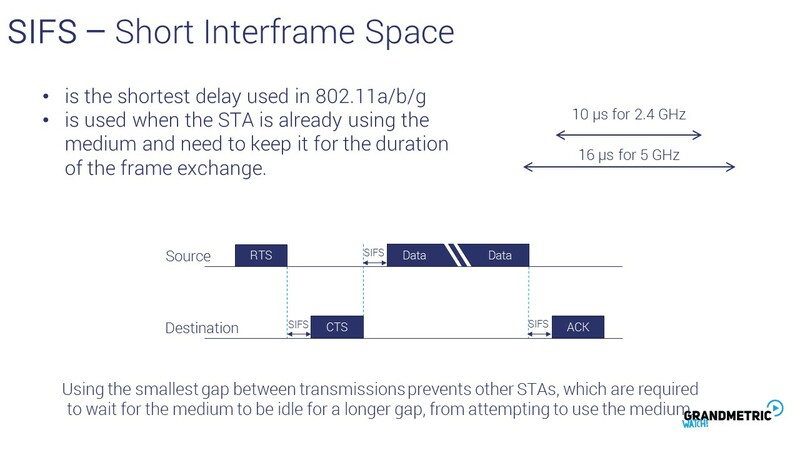 If the CW is larger for given STA it statistically will be later in line for tranmission. 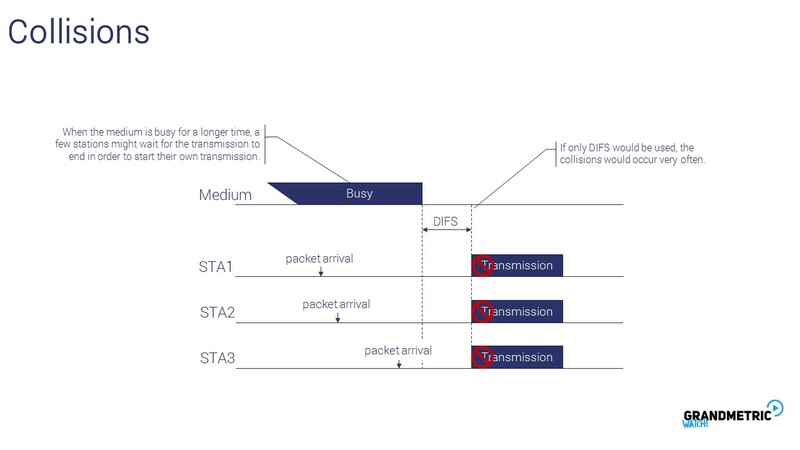 To sum up the carrier sensing and delaying transmission lets take a look on following flowchart. First of all we must ensure that medium is free. Both NAV and CCA must indicate channel as idle to go to the next step. Then STA observes medium for required IFS interval. Still NAV and CCA must indicate idle medium. If this conditio is met the STA selects random backoff timer, unless the backoff was selected previously and was frozen. 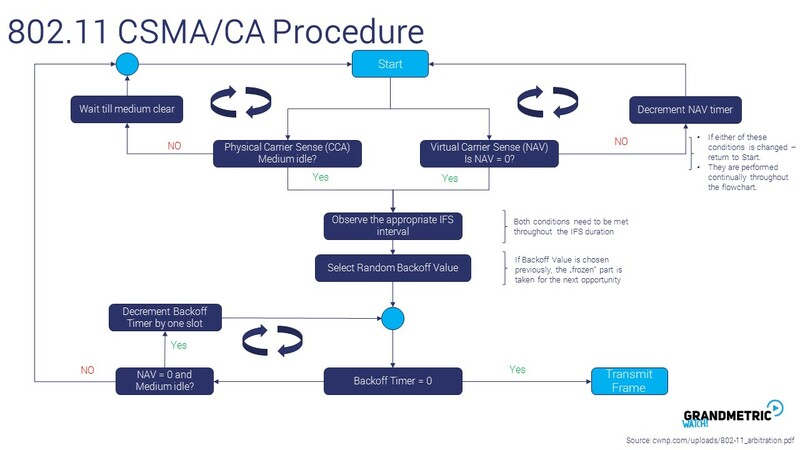 Then as long as NAV and CCA show idle medium the backoff is incremented slot by slot. If medium becomes busy, we go back to start and wait for idle medium. If we are lucky enought to to reach 0 with backoff timer the transmission starts. DCF allows network operation without any central coordinator or scheduler. STAs get access to the network by „competing” with the others. Sometimes, the access might depend on luck (since the backoff timer is selected randomly). 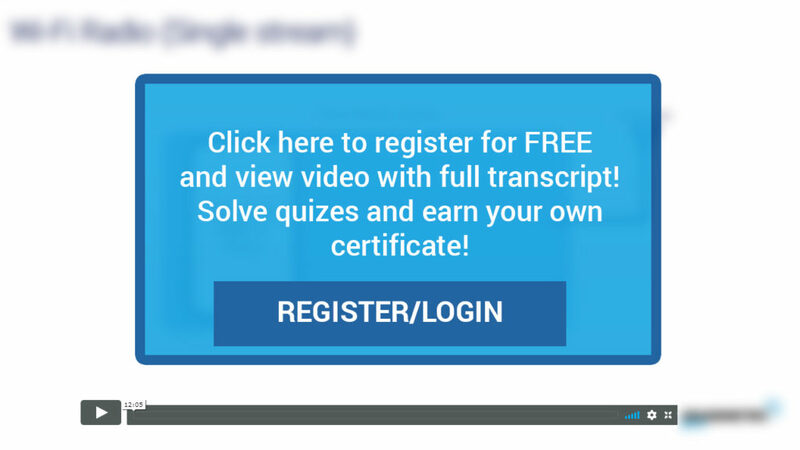 With such approach there is no way to guarantee any QoS. 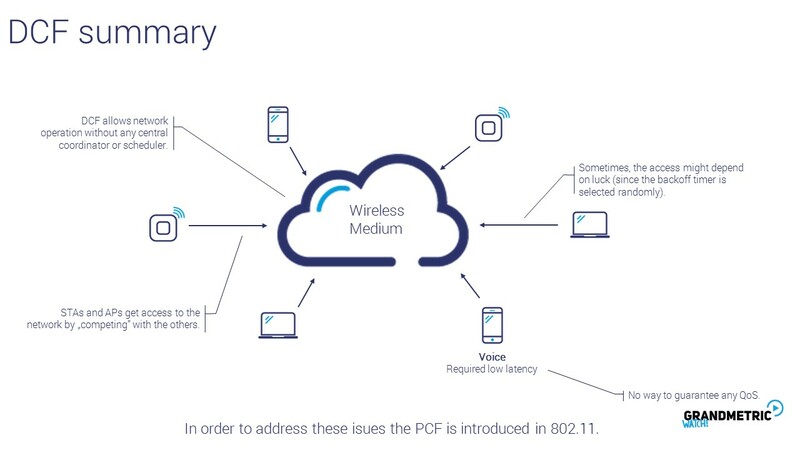 In order to address these isues the PCF is introduced in 802.11. 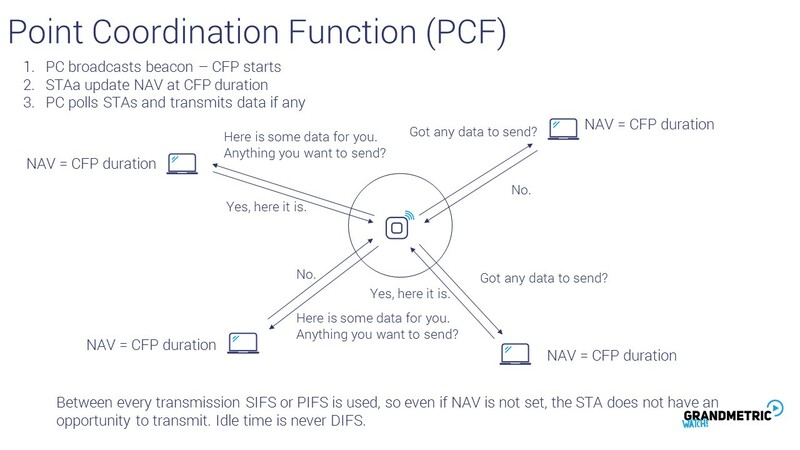 PCF is a solution that can be used if a strict QoS profiles must be followed or when the network is so congested that contention leads to nothing but collisions. In this mode, Point Coordinator (PC), which is usually an functionality of an AP querries all the STAs for data and distributes data to STAs in an organized manner. This is done during Contention Free Period (CFP). It starts with a beacon in which AP informs all stations about duration of CFP. STAs set NAV timer for this duration in order not to unncessarily sense medium as it will be busy all the time. Then PC starts polling all STAs for data and provide data to them if any. After CFP STA can „compete” for the medium in contetnion period. 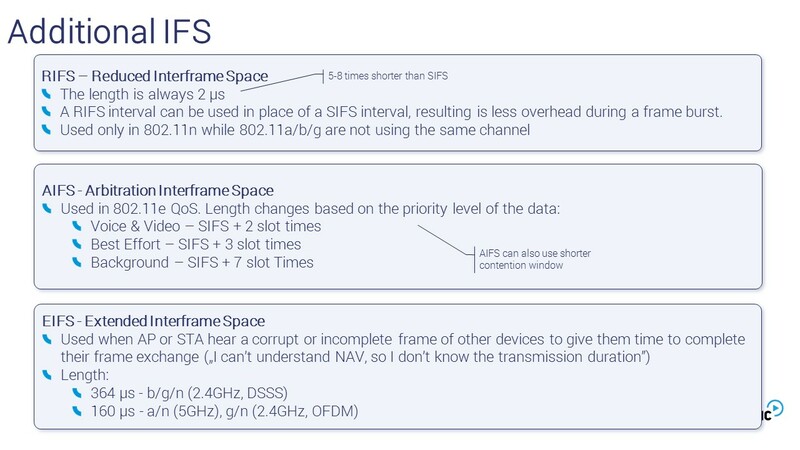 All frames in CFP are spaced either by SIFS or PIFS, and both of tchem areshorter then DIFS, so even station without NAV timer (if it joined the network later) wont be able to use medium in CFP on its own. This scheme is based on transmission coordination by one device, called Point Coordinator (PC).The role of PC is often assigned to an AP. PC can use another IFS – PIFS. This one is longer than SIFS but shorter than DIFS. 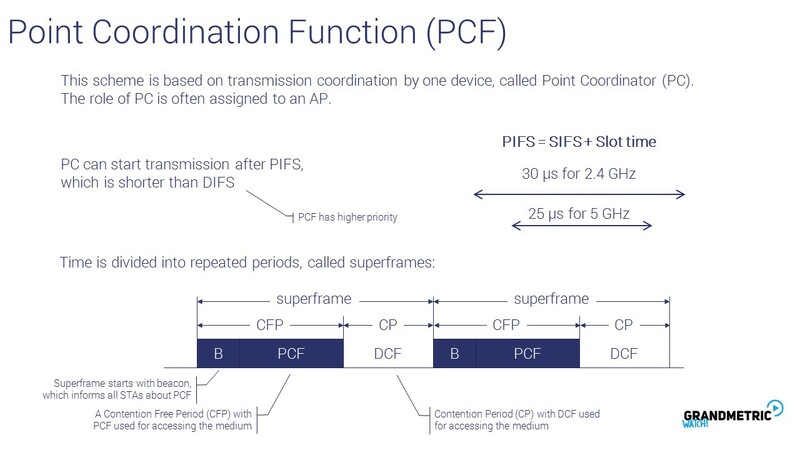 PC splits time into two periods – contention free periond and contention period. During CFP, the PC controls and decides the transmission order. CP works as classic DCF. 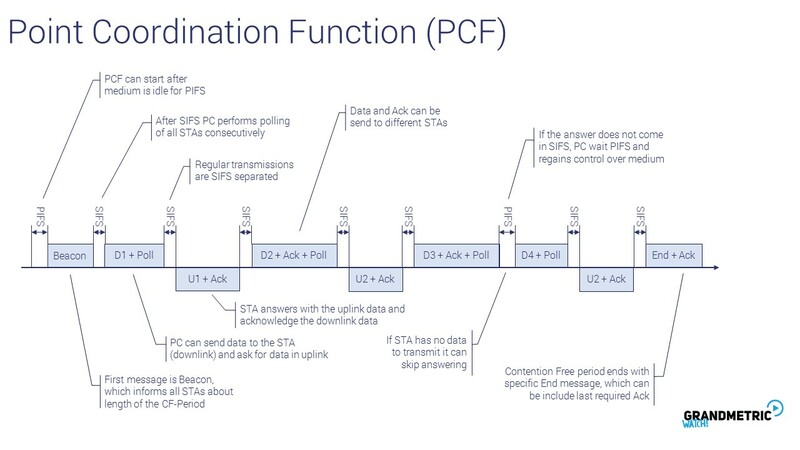 CFP starts with beacon informing stations about PCF. A pair of CFP, CP creates superframe, which repeats periodically.